The Blog Enhancement Suite is available in three different plans: Hobbyist (Free), Aspirant, and Professional. Start your very own community to better your blog and start growing your mailing list 3x faster! It's free and takes less than five minutes to setup! An expansion to the Hobbyist plan that opens up new monetization opportunities and turbo-charges the social media presence of your blog. Our top tier plan that comes with all the bells and whistles! Get full customization and access to our most advanced features, and earn a 10% bonus when cashing out referral earnings. A more descriptive explanation of each of our most prominent features and what plan they are available in. 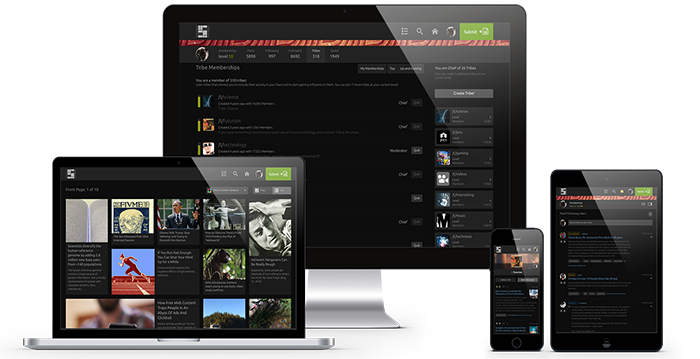 Run your own Snapzu community that's relevant in niche/topic to your blog. It's yours for free, forever, and will help transform your blog into a social and engaging experience unrivaled anywhere. Connect your Mailchimp account to your Snapzu tribe and start building your mailing list 3x faster. This new and unique method of collecting emails by offering "community access" is a monumental improvement on the old and tired "freebie" method of providing a free e-book, online course, or any other digital freebie in return for an email address. No third-party advertising anywhere on the Snapzu community platform. Your community (and/or widget) has no visit limitations or thresholds as we strive to be fair and equal to all community leaders/bloggers regardless of popularity or influence. Everyone deserves a fair chance. Your community (and/or widget) can have as many members as you (and your blog) can handle. Your community (and/or widget) can host unlimited content. Post, comment, and interact as much as your heart desires on your own community, along with the 1000's of other communities hosted on the Snapzu platform. The community voting system is a fair and democratic approach to content curation on the Snapzu platform. All community members can up/down vote on all submissions, comments, related links and more. The total sum of all votes decides a post's exposure time length, positioning, and size on the front page grid. It also allows each community to essentially self-moderate, making management a lot easier and far less time consuming. Your community is automatically plugged in to our existing network which will help gain (initial & additional) audience from tens of thousands of members in thousands of communities run by bloggers, influencers, and people just like yourself. Get access to unlimited invite codes and your community's own unique invite URL used to grow your community at your own pace. Quickly and easily embed your community directly onto your blog using your own community widget to vastly enhance its engagement and increase its content with user-submitted content from your community. Give your audience incredible new social functionality while making your blog stand out from the rest! "Mirroring" allows you to quickly duplicate other similar communities already submitted content into your own community. This nifty functionality allows you to easily maintain a busy and engaging atmosphere, especially important when your community is new and just starting out. Get notified the instant you get a new follower, member, mention, comment, or reply, using our baked-in notification system. The provided browser bookmarklet allows you to quickly and easily share any images, videos, and links with your community (and any other Snapzu communities), even when you're not on Snapzu at the time. Experience Points (XP) are earned for many activities on Snapzu and are used by members to reach higher experience levels. With each level up, certain permanent perks and upgrades are rewarded to each user. XP makes a great way to quickly distinguish new users from experienced users and adds an additional element of fun. Each member has a reputation score which is a percentage score (1-100%) based on recent activity and engagements, summed up from all up/down votes received from the rest of the Snapzu community. This adds an additional element of trust and helps thwart spammers, trolls, and any other unwelcome users. When any post/submission is down-voted, that member is asked to leave a reason for the down vote. Such reasons include: Re-post, Misleading, Blatant Spam, Excessively self-serving, Copypasta (Plagiarism), Broken Link, No NSFW Tag, Behind Paywall, Poorly Formatted, Bigoted, Incendiary, Factually Inaccurate, and None of the Above. This functionality allows the OP (original poster) understand why that specific post/share was down voted. The ability to communicate with your readers, participating members, or even other bloggers with our built-in private messaging brings huge networking and relationship building potential. Achievements are virtual prizes that are given out for participating in various activities in the community. There are 24 different achievements available for each member to earn, each with five different progress levels including ribbon, bronze, silver, gold and diamond. All community leaders and participating bloggers/influencers have access to our B.E.S. (Blog Enhancement Suite) community, where we discuss blogging in general, ask questions, leave suggestions, share experiences, offer tips & tricks, brainstorm "growth hacks", and anything else to help each other along the way. Have any problems, questions, or suggestions? Make a post on the /t/BES tribe and we will get back to you as soon as we can. Other members can also help you out! Monetize your community (and blog) in a new and revolutionary way and keep 50% revenue share split on referred member's credit (premium) purchases, along with the optional "support community/blog" buttons. Simply focus on the growth and well-being of your community (and blog) and leave the rest to us. Your community is provided with its own customizable RSS feed which will constantly push its highest voted content, a great tool for those who religiously live and swear by their RSS feeds. Additionally, use it with exterior automation tools (such as IFTTT) to automatically promote your blog's and tribe's posts on various social networks such as Twitter, Facebook, and Medium. It's super easy and we will show you exactly how to do it! Get Snapzu Platinum member access (a $5/month value) for yourself, which comes with its own set of perks on the Snapzu community platform. Receive 1 free one-month premium membership upgrade every month to give out to a top tribe member of your choice. These can make for a great incentive for participation in your community and your blog. Your top community posts automatically attempt to accumulate members to your tribe via our timed promotional tools designed to maximize opt-ins. This includes all traffic: organic, search engine (SEO), word of mouth, and more. Our "freemium" business model heavily depends on word spread using our "Powered by Snapzu" link located on the bottom of the community blog widget. In our paid Aspirant and Professional packages, as a thank you for supporting us financially, we give you the option to remove it. Each and every month we will automatically compile your community's top 50 posts (as submitted and voted by your members, readers, and even yourself) into a nifty top list post that you can then quickly and easily post on Snapzu, your blog, your social channels, and anywhere else! This incredibly time-saving feature will regularly construct you a valuable and highly shareable list post that efficiently promotes your blog and community. Coming in mid-2017! Automatically send out monthly emails to members of your community that opt-in to your tribe newsletter. These will display the best posts, shares, comments, and top contributing members of your community. Coming in mid-2017! The ability to fully customize your community's widget ensures that it looks exactly how you want it to when embedded on your blog. With the added abilities to edit colors, specify the type of content shown, change the default sorting options, and raise/lower default thresholds, your widget will be exactly how you want it. Automatically increase your cash-out amount by 10% as a bonus for using our professional solutions and supporting the Snapzu platform financially. Receive an additional 2 free one-month premium upgrades every month (for a total of 3) to give out to top tribe members of your choice. Use them in giveaways and contests to incentivize participation and grow your community! Need live help? Chat with one of our live support agents during our operational hours of 9-5 PST, Monday thru Friday. Your widget gets an optional "Support Blog" button that allows your members/audience to support your community (and blog) directly, while also getting Snapzu Platinum membership in return. Grow a loyal audience that will support you, your community, and your blog! Coming soon. Each and every week we will automatically compile your community's top posts (with the exact amount specified by you) into a nifty top list post that you can then quickly and easily post on Snapzu, your blog, your social channels, and anywhere else! Coming soon. Automatically send out weekly emails to members of your community that opt-in to your newsletter. Coming soon. Host your own stand-alone community on your own domain, instead of using just the embeddable widget. Coming soon!